In Newnan, I will be doing an installation art project with handmade paper from local plant materials and create a new series of paper quilts with a contemporary interpretation of traditional Southern quilt patterns. This photo shows my first paper quilts created at Sitka Center for Art & Ecology in Otis, Oregon, during my residency at Sitka Center in 2013-14. 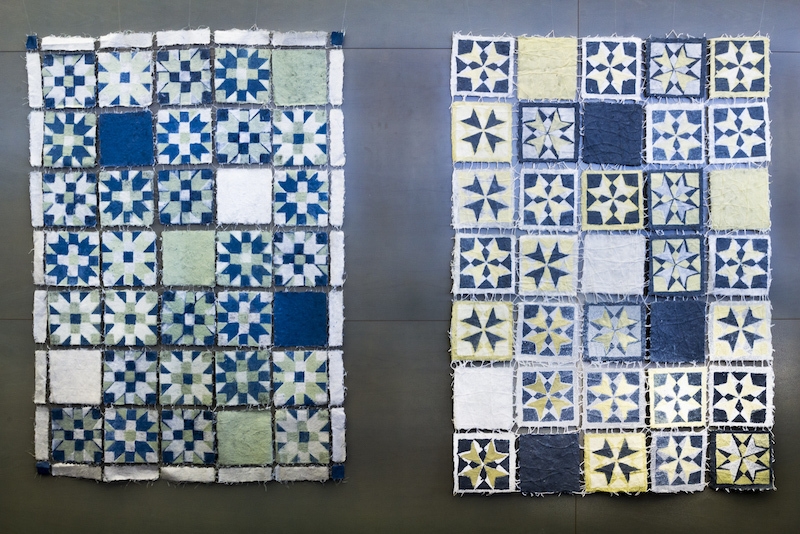 The quilts were inspired by seeing the many “hex signs” on the barns in the area around Sitka Center. I also did a quilt-related installation in 2016 as an artist in residence at Lancaster Museum of Art & History, Lancaster, CA. 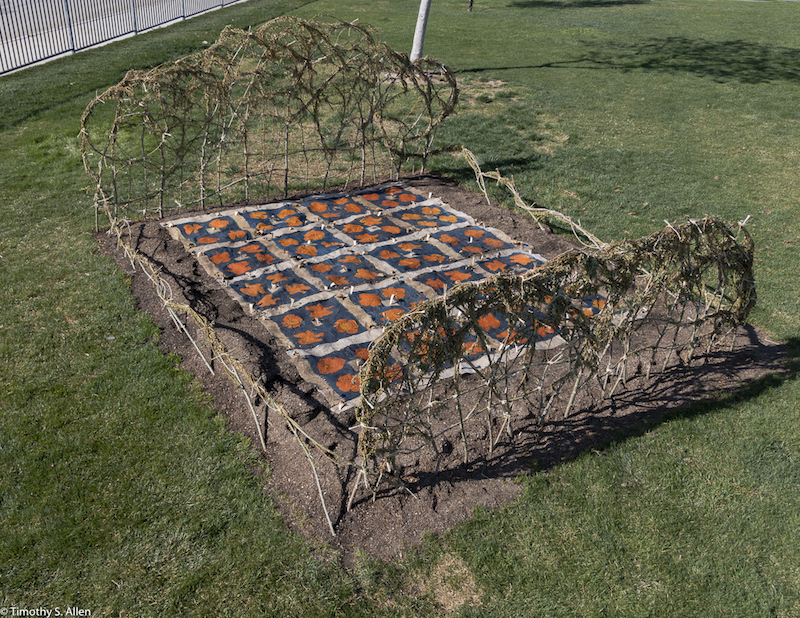 This photo shows the “Lancaster Eco Quilt installation. The handmade paper quilt has seeds for local wildflowers in the handmade paper, and as the paper dissolves into compost the seeds will grow and bloom in the same pattern. Newnan, a small city southwest of Atlanta, is where my ancestors settled before moving on to Alabama when they first came to the US from Scotland and Ireland. 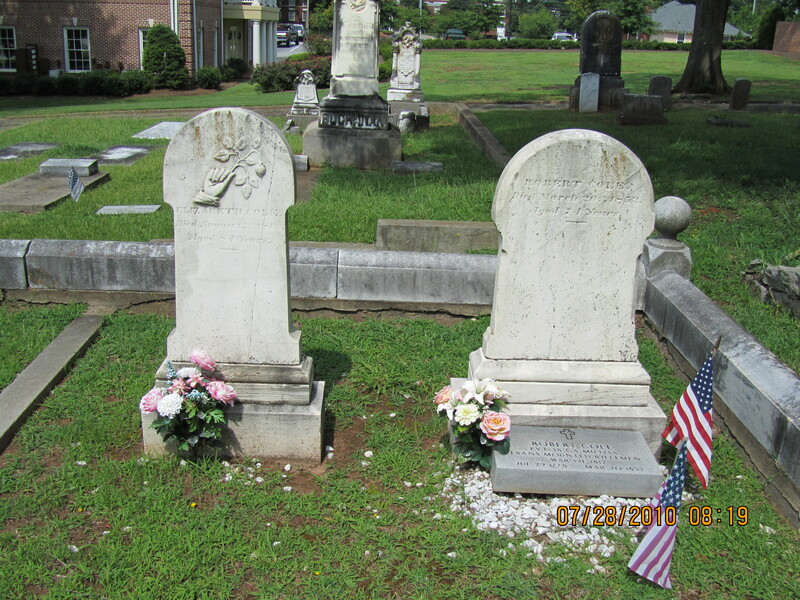 Here is a photo showing the graves of my great great great grandparents, Mr. and Mrs. Thomas Cole, on my father’s side in the Oak Hill Cemetery in Newnan, GA. I also learned that the ancestors on my mother’s side also settled in the Newnan area, and my great great great grandfather James Hutcheson built the Hutcheson/Redwine Plantation that is still standing and now a sort of museum. For me this residency will be a chance to reconnect with my roots and to create new work using local materials and inspiration. Newnan Art Rez is a relatively new residency program that aims to bring contemporary artists there to interact with the local artists and community people. During my residency I will also work with art students at the University of West Georgia. Keep watching here for photos and information about my artist in residency in Newnan, GA during the month of August.